Summary: Sea Turtle Conservancy will continue its successful Tour de Turtles Educational Program through 1) deploying satellite transmitters on four post-nesting adult loggerheads in and around the Carr Refuge; 2) conducting educational activities at two live releases; and 3) providing free up to date educational materials for educators on the Tour de Turtles website. To enhance local excitement and media coverage of the program, STC will coordinate two live “starting” events around the released satellite-tagged sea turtles. 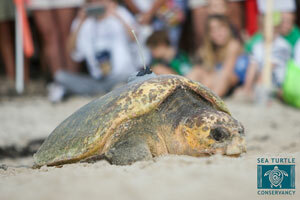 These releases have been attended each year by over a thousand spectators and include sea turtle educational activities, such as a crawl-through TED, sea turtle research station, and a lighting awareness game. The Tour de Turtles successfully raises awareness and is promoted by targeting previously-registered educators, schools and educational associations via emails, websites, social media, and through program partners.